Many topics get discussed at London Calling, and the recent arrival of ‘Shrek the Musical’ to the Theatre Royal, Drury Lane led us to reminisce about the big screen to stage transformations which have paved the way for the latest re-incarnation to hit London’s west end. ‘Star Trek: The Musical’. It has a certain ring to it don’t you think? Who can’t imagine Spock and Kirk belting out a duet, mid - Klingon battle, with Uhura and Scotty providing the much-needed harmony? Or is it just me? Following the recent techno-debacle and subsequent bad press that Broadway’s Spider-Man: Turn off the Dark has received, it’s important to remember the success stories. Two of the early adopters came from Disney. Beauty and the Beast has played to over 35 million people since starting in 1994, whilst The Lion King has been running at The Lyceum since 1999 and has won seven awards in the UK alone during that time. Billy Elliot is still going strong since being adapted for the stage in 2005, and more recently Legally Blonde won 3 awards at the Olivier’s and launched the stage career of the brilliant Sheridan Smith. The topic of conversation then developed into what films we would love to see put on stage but in all likelihood never will. Apocalypse Now, The Lost Boys and Top Gun were all mooted before failing to make the top five we finally decided on. I’m sure you’ll come up with five of your own, but how much fun would you have watching these! Ok, so we’re cheating a little here as the world arena tour hits the O2 in a little under two months, but we can’t wait! Try to imagine a thirty foot tall Joker face with Batman and Robin racing out of his mouth to fight The Riddler, Penguin, Poison Ivy and Catwoman whilst driving round Gotham City in a Batmobile designed by Formula One moguls! Well now you don’t have to. Excited yet? You should be! Anyone fancy a musical done solely to the Music of McFly? Didn’t think so. But imagine a Delorian flying across stage with Marty hanging on to it’s bumper on a hoverboard being chased by a baritone Mad Dog Tannen. Follow that up with Doc Brown singing the signature tune of “One Point Twenty One Gigawatts” all done in the style of Huey Lewis and you’re on to a sure fire smash hit. It’s tempting to put every Leslie Nielsen film ever made in this list until you remember the disaster that was Naked Gun 33 1/3. But Airplane makes it in for the pure potential of the Saturday Night Fever club scene, Michael Jordan taking on the role of Kareem Abdul Jabaar and the audience singing along to “I’m deadly serious, and stop calling me Shirley”. “I shall cut your heart out with a spoon.” The catchy opening number to a rip roaring success if ever I heard one. With battle scenes, camaraderie, a love story and an infamous villain it’s a sure fire hit, when you add in the tunes of the ’groover from Vancouver’ and you have the next Mousetrap on your hands. 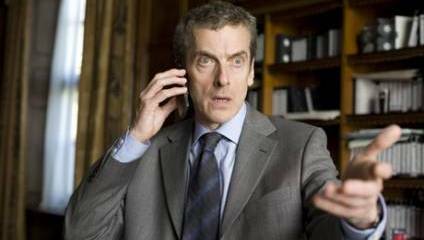 Has there been a finer character on screen in recent times than Malcolm Tucker? Now imagine him live on stage hurling profanities in rhyming couplets, having an appearance on Question Time insulting Dimbleby and a rap battle with the opposition leader. Forget Hammer Time, it’s Tucker time. Can’t ****ing touch this!